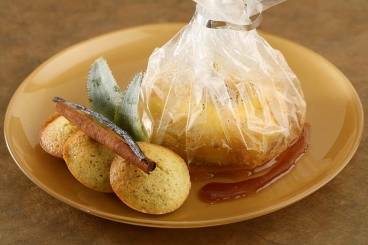 Steamed pineapple flavoured with rum and vanilla served with cinnamon financiers. Mix together the egg whites, sugar, flour, ground almonds and cinnamon. Melt the butter to a beurre noisette and then add to the mixture. Place the mixture into financier moulds and bake in the oven for 12-15 minutes. Remove from the oven and rest on a cooling rack. Peel the pineapples, cut each one into 3 slices and remove the tough core. Split the vanilla pod in half and add the seeds to the rum. Place a piece of pineapple on to a sheet of Carta Fata cooking paper. Gather the edges and add a generous drizzle of rum. Seal the papillotte parcel. Place the papillotes in a frying pan and cook over a low heat for 5 to 6 minutes. As the pineapple cooks, the papillotte will expand. Remove from the heat, open the papillottes and then serve the pineapple with the cinnamon financiers and a splash of the vanilla rum.